After nearly 20 years of cranking, Patagonia's R1® fabric remains a benchmark for alpine efficiency—and this season they’ve refocused the Pullover Hoody for the technical core user. 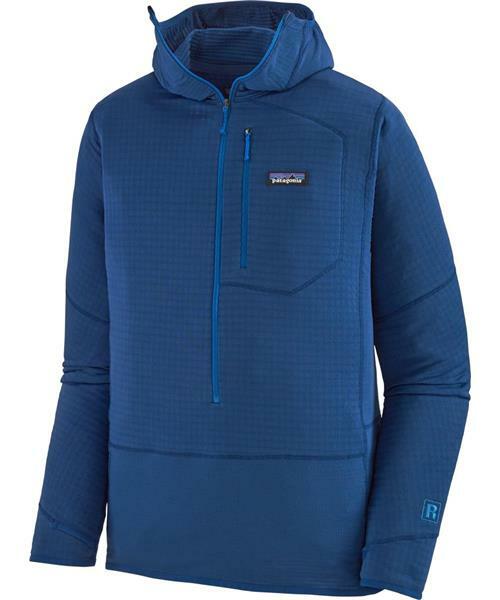 Its high/low grid interior (Polartec® Power Grid® polyester) is key to the hoody’s versatility—it’s the lightest and most breathable iteration ever, and still exclusive to Patagonia. It stretches, traps heat and compresses down to practically nothing. For higher-output use and enhanced mobility, they have incorporated lighter weight, super stretchy grid fabric along the side panels, in the snug-fitting balaclava-style hood and at harness line. A minimalist, deep-venting front zipper allows for further temperature regulation, with a soft zipper garage to keep your chin comfy, while the off-shoulder seams sit comfortably under your pack straps. The sleeves push up easily when it’s hot, but have discreet on-seam thumb holes for added warmth when it’s cold. The torso is now 1" longer for layering under a harness. With an exterior left-chest pocket and Polygiene® permanent odor control.